Domestic and commercial electricians Electric City are proud to provide a reliable service that has earned us an excellent reputation with both domestic and commercial customers. Established in 1995 by John Lane, the business has grown in a controlled way to ensure we only take on the best electricians, making sure we maintain our high levels of service. 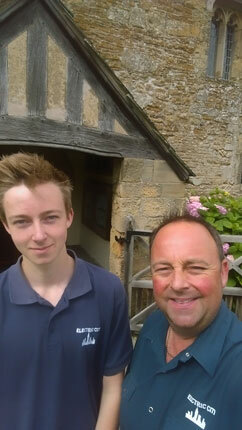 John’s son, James, has recently joined the team of electricians in York, making it a real family business. We are delighted to know the business can continue to grow in another safe pair of Lane hands! Service to our customers is really important. We want them to know they have received the best advice, the best products and the best service. As fully qualified domestic and commercial electricians, we provide electrical reports for all work we carry out when needed, giving you the peace of mind that everything is safe and compliant. We are experienced York electricians and are happy to help our customers with all types of electrical work, at home or work. We undertake small maintenance jobs as well as large installations, making it easier for you by dealing with one company for all your electrical requirements. Please call us on our freephone number 0800 0345 240 and we would be happy to visit you and have a chat to discuss your requirements. We offer a free no obligation proposal and quotation service so you have full peace of mind before we start any work.